Imagine a nearly silent train that glides along its tracks emitting nothing more toxic than water. That train is a reality. 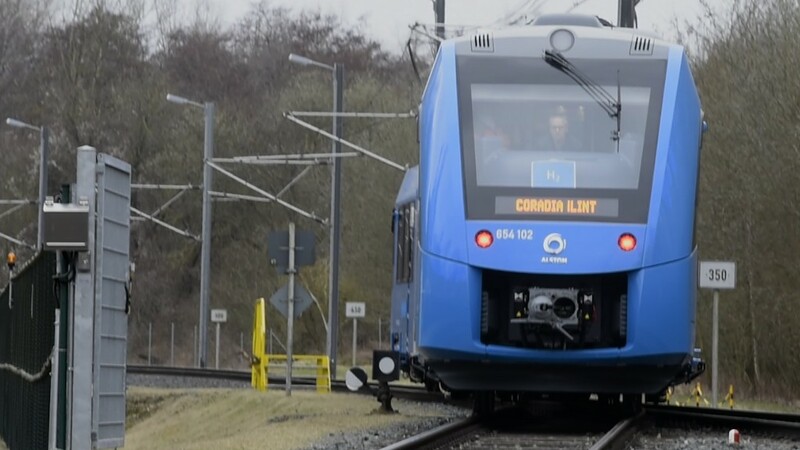 In March, Germany conducted successful tests of the world's first "Hydrail" -- a hydrogen powered, zero-emission train. "The new train is 60% less noisy than a traditional diesel train, completely emission free," said Jens Sprotte of Alstom, the French producer of the train. "Its speed and the possibility to transport passengers match the performance of a diesel train." "The only sound it gives off comes from the wheels and air resistance," Sprotte added. The Hydrail uses the same equipment as a diesel train but substitutes hydrogen as its fuel source. Large fuel cells sitting on top of the train combine hydrogen and oxygen to generate electricity, which is then transferred to lithium ion batteries. Energy that is not immediately used can be stored for later use, increasing fuel efficiency. The train's only emissions are steam and water, resulting in minimal impact to the environment. "It's so clean you can breathe it in," said Stefan Schrank, the train's project manager at Alstom. Five federal states in Germany have signed a letter of intent to purchase a total of 60 trains from the French firm. Each two-car train set requires a fuel cell and a 207 pound tank of hydrogen to supply it. The oxygen is supplied from the air around the train. The train can travel up to 500 miles per day on a single tank of hydrogen, carrying 300 passengers at a time. The first operational trains will roll out by the beginning of 2018, providing a green alternative to the 4,000 diesel trains currently operating in Germany. According to the EU, about 20% of Europe's current rail traffic runs on diesel. The new train is ideally suited for short stretches of the European network that have not been converted to electric rails. Germany is particularly interested in reducing its greenhouse gas emissions. A recent German Environment Agency report said the country continues to emit the equivalent of 906 million tonnes of carbon dioxide (CO2) a year, tarnishing its reputation as a green energy pioneer. Kristina Juhrich of the German Environment Agency said last year's emissions levels will make it difficult for the country to reach its climate target and reduce emissions by 40% in 2020. Alstom are hoping the train will turn a profit within its first couple years of operation. They hope the model will replace Germany's fleet of diesel trains in five to 20 years. The Netherlands, Denmark, Norway and the U.K., which have also expressed interest in the train.